MEET & TRACK YOUR HEALTH GOALS! Use Track Your Weight to help meet your diet and weight loss goals. It is a reliable fitness app with tons of useful information. It also has statistics and graphing options tailored to your health and body! - Track any number of profiles. - View statistics like Body Mass Index, average weight change per day, required future weight change per day. - Enter in goal weight and date. 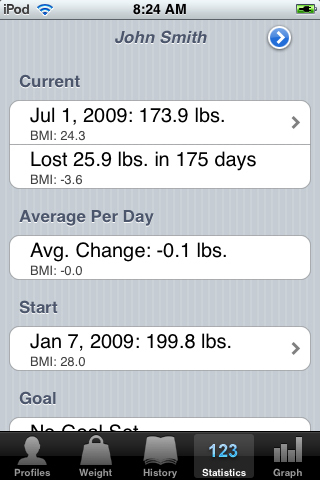 - Change the starting date if you want to view statistics based on a new diet you started recently. 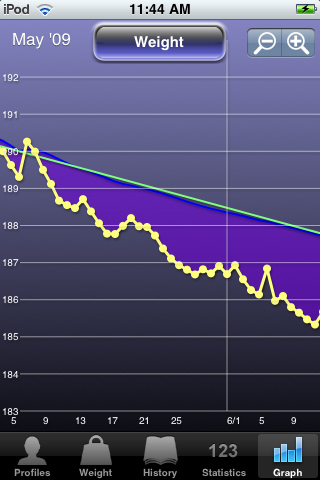 - A graph view shows your weight loss visually. - Or you can view the numbers in a list. - Configurable to use pounds or kilograms. - Enter a weight from any time in the past or future. - Enter in multiple days’ weights quickly. - Added CSV Export to back up, edit, or view data from a spreadsheet program such as Excel. - Concrete Software is dedicated to providing you with quality apps- including support. Please visit our support forums at www.concretesoftware.com/forums/ for help, suggestions or feedback. • 1.0.36 - Update help text. 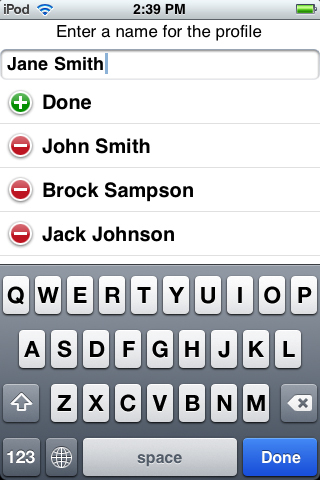 • 1.0.35 - Added compatibility with OS 4.0 and the iPhone 4. 1) Added Feedback & More. 2) Added Stones to Mass. • 1.0.33 - Fixed a connection issue. • 1.0.32 - Improved profile name entering process. • 1.0.31 - Added a password confirmation when setting a password. 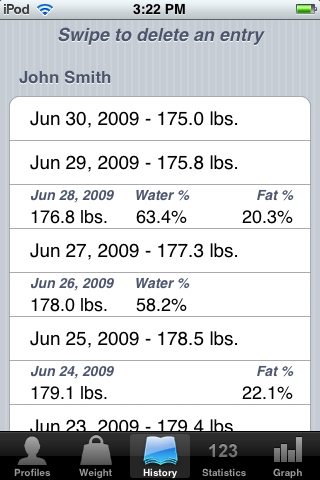 • 1.0.30 - Added the option to reorder water/fat/weight setting. • 1.0.29 - Added Goal Trend line. • 1.0.28 - Added Percent Weight Change to stats screen. Also added Facebook/Tell a Friend. 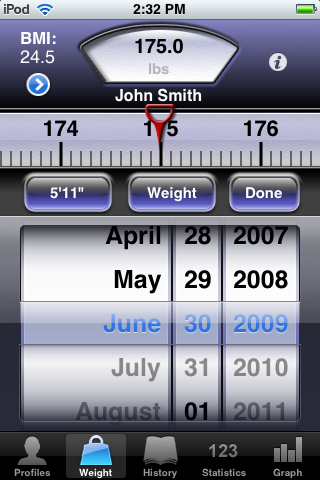 • 1.0.27 - Added support for weight gain goals. Other Apps by Concrete Software, Inc.